Shuttle (red) and station (blue) crewmembers participate in a joint crew news conference while aboard the International Space Station on Sept. 4, 2009 during the STS-128 shuttle flight. WASHINGTON- For rookie astronauts flying aboard the International Space Station, the foodis good, the rocket thrusters are loud and there?s an odd tang in the air -apparently from outer space. ?It?s avery, verydifferent environment than I expected,? Discovery shuttle pilot Kevin Ford,a first-time spaceflyer, said from orbit late Friday. One of thingsFord wasn?t ready for is the weird smell. ?From the[spacewalks] there really is a distinct smell of space when they come back in,?Ford said from the station in a Friday night news conference. ?It?s like?something I haven?t ever smelled before, but I?ll neverforget it. You know how those things stick with you.? In thepast, astronauts have described the smellof space as something akin to gunpowder or ozone. The soundsof spaceflight have also been surprising, especially when Discovery fires up itslarge maneuvering thrusters, Ford said. ?It definitelygives the shuttle a kick and you just feel a little twang throughout the wholeorbiter when they?re firing to keep you in position,? he added. Of the 13astronauts aboard the International Space Station and docked shuttle, nearly halfare taking their first trip to space. For some, it?s a short trip aboard theshuttle, which blastedoff last week with three rookies aboard. Other first-timespaceflyers are on the station for the long haul. Some have already been therefor months, so the term ?rookie? barely applies. ?The foodis wonderful,? said rookie astronaut Nicole Stott, who arrived at the stationSunday on Discovery to begin a three-month stay. ?Of course we have a mix fromall the partners now.? The result,she said, is a sort of orbitalsmorgasbord that includes food from the United States, Russia,Canada, Japan and Europe. ?I thinkyou can find something for everyone,? Stott said. Discovery?sseven-astronaut crew is in the middle of a 13-day mission to deliver freshsupplies and new science gear to the space station. 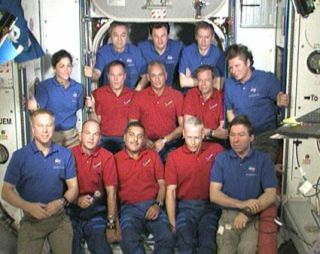 The astronauts ferriedStott to the outpost to replace another NASA astronaut who will come home onthe shuttle. They alsodelivered a $5 million treadmill named after comedianStephen Colbert. Even someof Discovery?s grizzled veterans were surprised by the life aboard the station,which is the $100 billion product of 16 different countries. ?It?sreally awesome to see all the work that?s been achieved up here since our lastflight,? said Discovery commander Rick Sturckow, who is making his fourth flightto the station. ?They?ve added a new solar array and some new modules. Thestation is something that all the international partners can be very proud offor their contributions. ?